Apailana was a Human female who served as the successor to Neeyutnee as Queen of Naboo, replacing her following Neeyutnee’s two-year term. In a similar fashion to the previous monarchs, she was formally styled Her Royal Highness, Queen Apailana of Naboo during her two-year reign. Apailana was assassinated in 18 BBY by the Empire after it was revealed that she was harboring Jedi fugitives of Order 66 on Naboo. 1. Kimono-style undertunic or gown with long, knuckle-length, fitted sleeves in a dusty rose-pink pleated, homespun fabric. 2. Floor-length skirt or Hakama pant of finely knife-pleated iridescent lavender/pink cross-dyed silk dupioni or dupioni-like fabric. 3. Floor-length full kimono of a warm, golden silver metallic brocade in a herringbone-like pattern, large knee-length, rounded wing-shaped sleeves and a small train. 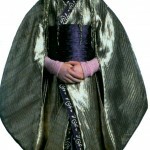 The outer seam of the sleeves is trimmed with lavender purple piping in the same fabric as the obi. The lower front edges of the kimono are folded back asymmetrically and tacked down to expose the underskirt. The kimono is trimmed with a wide band of lavender purple velvet or velveteen embroidered with silver and gold decorative elements. 4. Very wide, pleated obi of a lavender purple silken brocade or jacquard with a scattered fan pattern; the obi has a large obi pad in the back. 5. Art Deco-like perforated silver fan headdress with flanking filigreed half egg shapes dry brushed in a cool lavender that cover the ears. Rising from the silver fan is a larger fan of tall, soft and thick ostrich feathers in a cool lavender gray shade. Thick gray lace appliqués encrusted with silver/hematite beads and gray pearls are attached to the front and back of the fan, with many multi-length strands of beads and pearls descending from them. The center front section and side back sections of strands are pulled back, twisted and pinned around the half eggs. The side front sections and center back sections are left to hang. 6. Low-heeled coordinating tailored pumps or flats. 7. Hair is pulled back into several long thin braids tied off with silver and hematite beads. 8. White make-up on the face, neck and hands (must not be splotchy or uneven). Lavender upper lip and white lower lip with a lavender strip down the center. Beginning 1” above each brow, aligned with the center of each eye, is a long thin lavender line that descends down over the lid and along each cheek, to end just above a lavender dot; the dot is in line with the nostrils.